On 12 July 1913, Major Arthur Prescott Trevor, the British Political Agent A mid-ranking political representative (equivalent to a Consul) from the diplomatic corps of the Government of India or one of its subordinate provincial governments, in charge of a Political Agency. 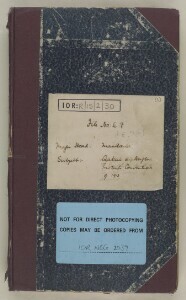 at Bahrain, received an urgent report from Yūsuf bin Aḥmad Kanoo, Bahraini merchant and part-time munshi A secretary or political assistant working in the British administration in the Gulf, often also providing linguistic interpretation. at the British Agency An office of the British Government and, earlier, of the East India Company. , that Sheikh Jāsim bin Muḥammad Āl Thānī was very ill. In a letter, Jāsim’s son, ‘Abdullah, wrote that one of his father's legs and all of one side of his body were swollen. The British Political Agent A mid-ranking political representative (equivalent to a Consul) from the diplomatic corps of the Government of India or one of its subordinate provincial governments, in charge of a Political Agency. speculated that the elderly Sheikh may have suffered a stroke and commented that, whatever the case, ‘it looks rather serious for a man of Sheikh Jāsim's age’. Trevor received a further report from Kanoo informing him that the Sheikh’s condition had improved somewhat after having been branded – i.e. cauterisation, or al-kayy, a traditional Islamic medical treatment once popular in the Gulf. Trevor wrote letters to Sheikh Jāsim and ‘Abdullah, enquiring after the Sheikh’s health and wishing him a speedy recovery; however, they were sent too late. The Sheikh had passed away five days previously, at 4 pm on Thursday 17 July 1913 after the swelling had spread to his chest. He was buried at Lusayl, on the coast between modern-day Doha and al-Khor. In a letter to Trevor dated 19 Sha‘bān (24 July 1913), Sheikh ‘Abdullah, who succeeded his father as ruler, thanked the Political Agent A mid-ranking political representative (equivalent to a Consul) from the diplomatic corps of the Government of India or one of its subordinate provincial governments, in charge of a Political Agency. for his letters and announced his father’s death: ‘God Almighty decreed and it happened that on the night of Friday [Thursday night] he passed into the blessings of creator. May God take pity on him and pardon him’. In a letter written in the days following Jāsim’s death, Trevor remarked to Sir Percy Cox, the British Resident in the Persian Gulf Historically used by the British to refer to the sea area between the Arabian Peninsula and Iran. Often referred to as The Gulf or the Arabian Gulf. at Bushire, ‘It is reported that Sheikh Jāsim has left a considerable fortune which he has distributed in legacies to relatives and servants and slaves’. A further intelligence report sent by Kanoo to Trevor provides a vivid picture of the wealth that the Sheikh left behind. According to Kanoo’s report, the estate of Sheikh Jāsim amounted to 70,000 rupees, 20,000 dollars and 6000 Turkish liras. As the head of a prominent pearl merchant family, his wealth in pearls was said to be 600,000 rupees; in addition, loans were owed to him in the region of 150,000 rupees. He also owned slaves who were valued at 100,000 rupees, as well as camels and horses said to be worth 200,000 rupees. Although these amounts are difficult to convert into today’s values, they do indicate that at the time of his death Shaikh Jāsim has accrued a considerable fortune. Kanoo notes that his estate was ‘divided into three portions’. Two of these were ‘to go to all his sons and daughters equally, and the third portion after paying again Rs. 10,000/- [rupees] to each of his sons from it, will remain in the hands of Sheikh Abdullah’, his son and successor, ‘for distributing to poor people’. Upon his death, Sheikh Jāsim also had three young children who were to inherit 40,000 rupees ‘over and above their shares of the two portions of the estate’. Members of Sheikh Jāsim’s extended family also received sums of money, including his brother, Sheikh Jabur bin Muḥammad Āl Thānī, who received 25,000 rupees, his sister’s son, who received 5000 rupees and an unnamed female relative who received 2000 rupees. Outside his family, Sheikh Jāsim bequeathed 5000 rupees to his servant, and 700 rupees each to four of his slaves. In addition to his household, amounts of money were given as charitable donations to various Wahhabi religious personalities and the poor of the Najd. Intelligence gathering at this time was not an exact science and without further documentary evidence it is difficult to know how accurate these details are. However, Yūsuf bin Aḥmad Kanoo’s intelligence reports shed some light on the circumstances of Sheikh Jāsim bin Muḥammad Āl Thānī’s death and are an indicator as to the extent of his wealth and status when he died. Moreover, the gathering of this kind of intelligence by the British and their native informants was of great political importance to the functioning of the Empire. Knowledge was power and Britain’s colonial administrators required to know everything they could about the wealth and status of members of the ruling families that they supported. Given the decline and ultimate withdrawal of the Ottoman Empire in the Persian Gulf Historically used by the British to refer to the sea area between the Arabian Peninsula and Iran. Often referred to as The Gulf or the Arabian Gulf. 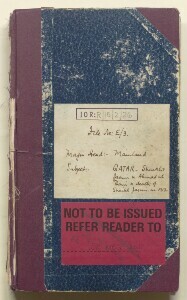 , Sheikh Jāsim’s death was particularly significant for the British since his son and successor, Sheikh ‘Abdullah, would ultimately sign the Anglo-Qatari Treaty three years later on 3 November 1916.